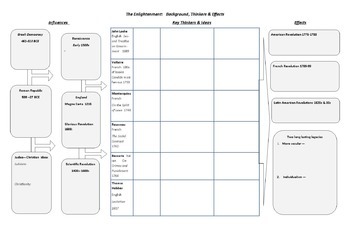 You get an 11"x 17" graphic organizer which includes a complete picture of the Enlightenment. 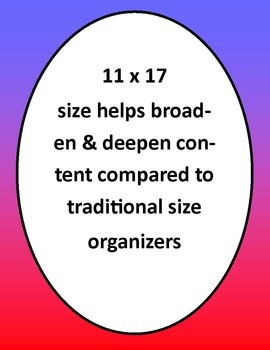 With the extra space it allows for a broader and deeper understanding than one can fit on an 8.5 x 11" organizer. 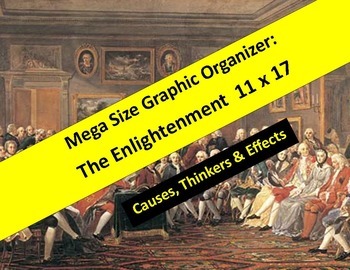 The 8.5 x 11 graphic organizer is a truncated version of the larger one in that it omits the background & causes of the Enlightenment but focuses Enlightenment Thinkers and their contributions to the American Revolution, French Revolution and Latin American Revolutions. An answer key for both versions to use as you see fit. Copy onto the back of the blank organizer as a reference, use with a projector to guide students or as a key when grading the organizers. Ten high level questions with key are also included for the 11 x 17 graphic organizer -- in Microsoft Word. 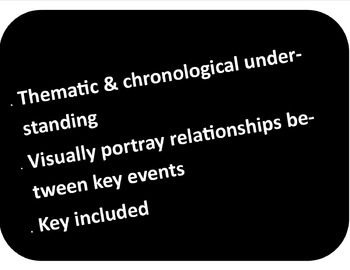 Students are required to make connections across time and among events/ideas when answering. Higher level thinking required.